Why is There a Water Pump Next to the Watermark Pond? …Let me tell you why it’s there! Of the roughly 7 billion people living on earth today, over 1 billion are without access to clean drinking water. Because of the lack of clean water, women and children in these areas must walk an average of 7 miles each day to find water from any source. Women and girls are often sexually assaulted and/or kidnapped as they walk to and from water sources in remote areas. What’s more, the water they collect is not the clean, healthy water that you and I would drink at home, but dirty water that is typically filled with bacteria, parasites, and animal waste. As a result, each year over 2.2 million people die from water-related illness. In fact, every 15 seconds a child dies from a water related illness. More kids die each year from water-related illnesses than AIDS, malaria, and tuberculosis combined. So when a water well is installed in a community, it impacts the daily life of every man, woman, and child who lives near the well site. It results in a reduction in water-related illness. The well gives kids – who once spent hours walking to retrieve water for their family – time to attend school. It causes a reduction in violence against women and girls (who are disproportionally responsible for collecting water). And in places where wells are installed, opportunities for evangelism and discipleship grow as church leaders invest the community around the well. In 2008, in conjunction with our ministry partner African Leadership and Reconciliation Ministries (ALARM), Watermark began drilling water wells in communities lacking clean drinking water in Northern Uganda and Burundi. Are there other organizations supporting this geographic areas needs? Is this a strategic location for broader ministry by ALARM? Is there an alternative clean water source within nine miles? Are there at least 250 people living in the area or willing to move there once water is available? Is there support from local leadership & citizens, to ensure resources are available to maintain the well after drilling? Do geology reports confirm that the location is promising for long-term water production? The wells are drilled and pumps (just like the one at Watermark) are installed in communities where ALARM is actively discipling and training church and community leaders. 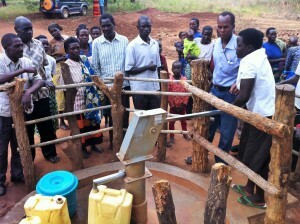 This is done because the water wells create a discipleship opportunity in those communities. The pastors who oversee the wells get to share the story of Christ’s “living water” that will never run dry, even as folks’ need for earthly water is satisfied. To date, Watermark and ALARM have drilled more than 30 wells in Uganda and 12 in Burundi. There are plans to bring “living water” to communities lacking access to clean water for years to come. How can you bring “living water”? Watermark / Watermark Blog / Why is There a Water Pump Next to the Watermark Pond?